Ten minutes after I pushed the last tent stake into the dirt, the first raindrop hit the fly, immediately followed by a slow growl of thunder. Liam was lounging in his car seat a few feet away, and I ran to get him under the safety of the tent before he was soaked to the skin. His eyes grew wide and his little arms jerked in a startle reflex at each crack of thunder. Just when I was afraid he’d break into tears and screams, his lips turned up at the corners, and a slow smile grew on his face. Yup, this kid laughs at thunderstorms. For the next twenty minutes or so, I sang sea shanties and he listened to the rain and watched the shadows dance across the tent fly, smiling and cooing at the strange turn of events. The storm was also the beginning of his love affair with the tent. 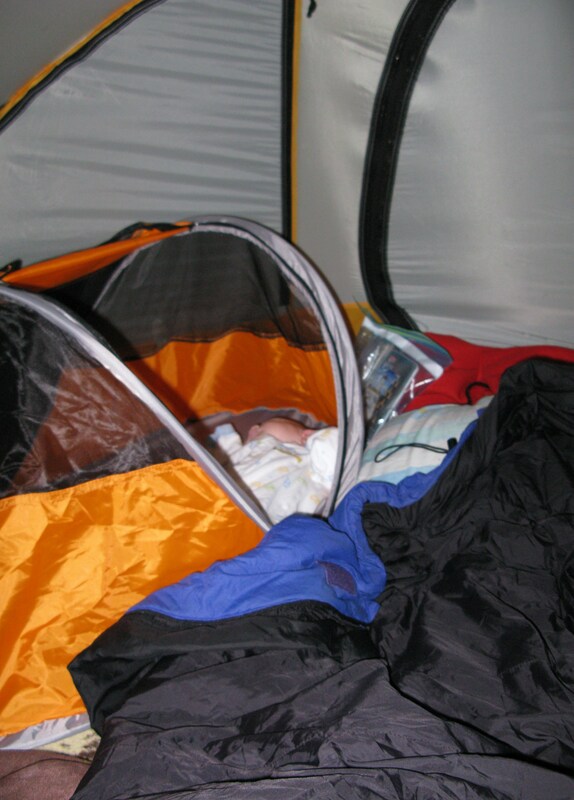 He woke early both mornings, but instead of fussing to be held, he babbled quietly to himself, and stared at the tent, engrossed in the patterns of moving light and shadow across the fabric. I think that he spent more awake time inside the tent than any other time during the weekend. He slept all through the hikes, the river games, the campfires (with the exception of one minor screaming fit during dinner on Saturday night, which was resolved by retreating to the tent). But the TENT, man, that was the best part. It was also the part of our first campout that had me the most worried initially, as I had visions of him screaming all night long, and angry neighbors storming into our site with pitchforks and torches. We have a longer trip planned in a few weeks, a possible backpack, and I’m hoping this infatuation continues. In the meantime, I’ll keep on with playtime in the Peapod out in our backyard, and daily mini-hikes in the conservation lands near our house. But so far, we are off to a great start.